A number of countries have been reclaiming land for centuries such as the Netherlands. But man-made islands are an engineering feat that have only recently left the drawing board. And the vision will continue to grow exponentially into truly amazing cities and other marvels during our lifetime that will marvel the imagination San Diego's Plan for Floating Airport. Why Not? Then there are the truly fascinating man-made floating islands for the very rich. But that’s another mini-blog series reserved for a little bit later down the road. Stay tuned. So interesting how we are creating islands. I'm a bit worried with the talk of sea levels raising that they may not be that safe though. Man-made islands--wow! Very cool idea. Apparently, they're talking a lot about overcrowding and population explosions in the schools...my high school son mentions it frequently. I think there are all kinds of issues with man-made islands, like settling problems. When home are build on former landfills, they have a tendency to settle causing walls and foundations to crack. I know of a whole subdivision near where I live that's having this problem. I can't help but think the same would be possible on a man-made island. Then there is the issue of storms and storm surges. Look at what happend with Hurricane Sandy. And with strong possibility of rising ocean levels, what will prevent these islands from being flooded? Very interesting and creative but I wish the world would go more for the population control solution. Land isn't the only thing we're going to run out of. I still remember the time an airliner landed in San Francisco bay and the passengers walked to the tarmac. 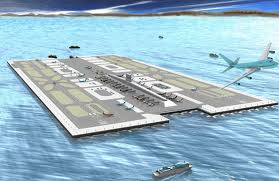 I can see some dog paddling if planes miss those island landing strips. I knew Japan had been dumping stuff into the ocean, enlarging their land. One of the areas hit by that big earthquake rested on such a spot. Wow. We'll do anything to "advance" except take care of what we already have! I personally think building man made islands is fine, if all the studies before hand show it won't be detrimental to the area being used. The feat of making man made islands is mind boggling and I bet it makes a civil engineer just want to jump on that boat to see what they could create! 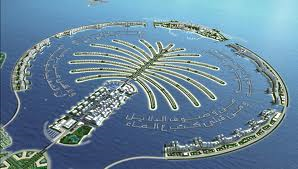 The Palm Islands have had their issues and I suspect they will continue to have them. The ocean can be relentless and unforgiving. Long time no see, Stephen! Those of us living in large homes should probably consider living in less square footage...like our Asian neighbors. Even so, while living in Southeast Asia, I learned that Singapore was building out on man-made land to accommodate their exploding population. This problem is here to stay. Recognise the Dubai residential "tree". I think we should make more of a push to colonise in space rather than starting to cover our oceans. No talk of underwater communities? It's kind of strange to thank of land being built, but if you think about it, all land was built. Just, they are doing it faster then nature can. Perhaps it would help if a lot of businesses also relocate outside the business hub areas? People flock into cities mainly to earn living. Like the case in the Philippines, there are a lot of empty areas in provinces when Manila is condensed! I believe efforts are on the way, on a brighter side, this problem has been fuel for resourcefulness and creativity.